The Wind Energy Group within the Department of Mechanical Engineering at The University of Newcastle, Australia, has been involved in the aerodynamic and structural design of blades for small horizontal axis wind turbines, for a number of years. With Energy Australia and the advanced composites group at Australian Defence Industries, the group has designed and constructed lightweight blades for a 5 kW machine, using Resin Transfer Moulding (RTM). 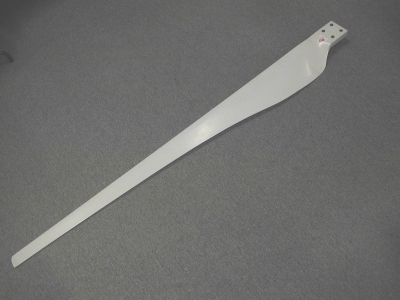 These 2.5 metre long composite blades have a mass of about 5 kg and a high flap-wise stiffness with a fundamental vibration frequency above the design rotational speed of the blade. The group is part of the Cooperative Research Centre for Renewable Energy (ACRE) and is currently designing and building test blades for a 20 kW machine. The group has designed and built blades for 600 W and 1.2 kW machines for Australian Windpower. A demonstration 5 kW wind turbine was also constructed at Fort Scratchley, a historic coastal landmark in Newcastle, as part of a NSW Office of Energy grant with Newcastle City Council. This turbine is being used extensively by the group for research work aimed at improving the understanding of wind turbine blade performance. Optimal aerodynamic performance requires the blade to have an aerofoil cross-section, a non-constant chord and be twisted. The steady forces acting on the blade are dominated by radial loading from blade rotation and bending due to aerodynamic loading. The directional nature of these forces necessitates the use of materials with strong directional properties. Wind turbine blades are subject to high fatigue loading due principally to the unsteady nature of wind, which requires them to be manufactured from materials with a long fatigue life. Furthermore the blade's complex three-dimensional geometry must also be accurately reproduced for maximum aerodynamic performance. As such the most cost-effective way to satisfy these criteria is to mould the blade using laminated composites. A FORTRAN program was written to generate the finite element mesh of the blade. Aerodynamic pressures at design conditions were determined from the results of panel code predictions and applied to the blade surface using the FORTRAN program. The file outputs from this program were formatted for direct input into Strand7. The blade structure consists of a skin of glass-fibre composite with a foam core. The foam core increases the bending strength of the blade preventing the relatively thin skin from buckling under compression. It is also desirable for the blades of small wind turbines to be sufficiently strong yet light-weight with a low mass moment of inertia to minimise the starting time of the turbine. The main task of the finite element modelling was to determine the amount and lay of fibreglass to achieve this goal. A non-linear static analysis was required to determine the stress levels in an operating wind turbine blade due to the stress stiffening effects of the centrifugal force on the blade structure. The first two increments in the non-linear analysis apply centrifugal loading to stiffen the blade. Subsequent load increments gradually add the aerodynamic loading. Early analysis of detailed strain gauge measurements taken from an operating blade on the Fort Scratchley turbine showed good correlation between finite element predictions and measurements.